The spin-off series to My Hero Academia (Vigilantes) enters its 3rd Volume in English! Vigilantes tells the story of Koichi Haimawari is a full time student and part time vigilante. He is part of a small group of other vigilantes who do hero’s work without an official license. This makes the work they do for the betterment of their neighborhood actually illegal. Its an interesting aspect of what encompasses MHA as a whole; that is, what it means to be a Hero! Celebrity first. 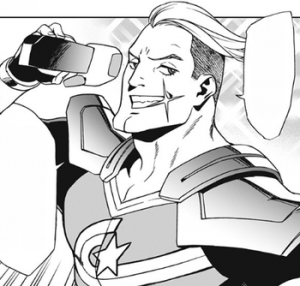 Known in this world as The United State’s number one ranking hero, he’s a swole, blonde, handsome guy who cares more about his popularity as a Hero than actually doing the job as one. If you want to see what a Hero is NOT, Captain Celebrity would be a great example! The second character introduced is Tsukauchi Makoto, a fellow student who one day decides to help Koichi with his floundering studies. She is introduced to the rest of Koichi’s friends and adds a new dynamic to everybody’s interactions! Her main objective is to do a research paper on Vigilantes. Its not hard to see why this begins to stir things up a bit. Not to mention, Makoto has an interesting Quirk that lets her know the validity of someone’s statement just by touching them. Its probably how she knew Captain Celebrity was full of it. The final character we get introduced to in Vigilantes vol. 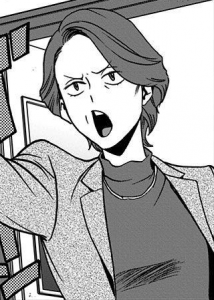 3 is Koichi’s mother, Shoko Haimawari. Like the other 2 characters, Shoko causes a bit of chaos in his life. An unexpected visit turns into a sad attempt at Koichi trying to impress his mom with his current life situation. We first meet his mother when she bursts through his front door, making her presence known. It was fun to see all of Koichi’s friends introduce themselves to Shoko and even butting heads with one of them! Did I mention that her Quirk is the ability to swat people psychically? Its called Flyswatter and it always looks like she is taking an invisible fly swatter and smack people with it from a distance. Its an ability for all aspiring overbearing mothers! The mystery of the Instant Villains continues to wreak havoc on Tokyo and cause many serious obstacles for not only our 3 vigilantes, but also for the 3 new characters we meet. Each explosive villain encounter tells us something new about Koichi or of his supporting cast. Vigilantes vol. 3 shows a display of refreshing and page turning character development. Kochi learns a new quirk ability, we meet his mom, Captain Celebrity learns a hard lesson in infidelity, and we see the series play with romance a bit. It an obtuse love triangle between Koichi Makoto and Kazuho. Its mostly in there for the comedy but has its moments of sincerity. One of my favorite thing about manga volumes are the mangaka’s behind the scenes sections. Vigilantes vol. 3 provides the reader little character design and development background. In other words, we come see the inspiration behind some character designs. The final parts of this volume actually consist of bonus chapters Sp.1 & Sp.2. They are supposed to be a smaller collection of stories within the Vigilantes series meant to tie the two series together a bit. Within the stories, we get to see familiar faces introduced to us in the main series since Vigilantes takes place years before Izuku Midoriya’s story. Even seeing them again feels like we are seeing new people. I look forward to more of these “side quests”. Overall, Vigilantes vol. 3 kept me engaged and even more invested in the series as a whole. This volume actually happened to line up perfectly with where I am in the Manga series at the moment. It always feels rewarding to catch all those Easter eggs! If you’ve never read My Hero Academia before, it is still pretty easy to jump into this series. It does a great job at introducing the world in which the story takes place. That being said, to get the fullest enjoyment out of it, definitely start with the main series first. I look forward to seeing more of the work from Illustrator Betten Court & Story Writer Hideyuki Furuhashi in their pursuit to tell us more about the messy intriguing world of heroism and make us all think what it means to be a hero.